Jeffersontown Indoor Winter Market at Jeffersontown Christian Church. They are open on select Saturdays 10am-1pm through April 2014. The Root Cellar has stores in Germantown and Old Louisville. New Roots partners with local places around the city to bring fresh produce to the communities they serve. 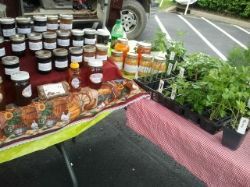 Louisville Farm to Table has some great information. wide variety of meats, eggs, and produce from the farm. Huber’s Market offers seasonal produce and also has a bakery and ice cream shop.